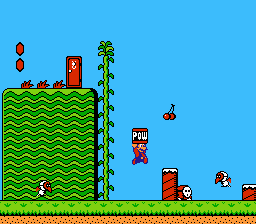 Super Mario Bros. is part of Nintendo’s long-running Mario franchise. The Super Mario Bros. games are platformers, but there are other games featuring the same cast of characters that are racing, puzzle, role-playing, sports, party, and educational games. The franchise has also been adapted into a wide variety of other media, including a television show and film. Although some people discuss the potential queerness of young boys who run the “risk of transgender identification” (Kinder, 1991, p. 107) when they play as Princess Toadstool (aka, Princess Peach) the links below refer to characters who are in the games rather than players’ relationships to characters. Some players see their connection to Princess Peach as a way they came to understand their gender (Monica, 2013), others disidentify (Muñoz, 1999) with the character (Evans, 2015), and others choose her because her ability to float is a strategic advantage. A Spanish-language satire website also started a hoax that Mario and Luigi were actually meant to be a gay couple, not brothers. Kinder, M. (1991). Playing with Power: In movies, television, and video games. Los Angeles: University of California Press. Muñoz, J.E. (1999). Disidentifications: Queers of Color and the Performance of Politics. Minneapolis: University of Minnesota Press.